thank you for all the nice comments on my cardigan! of course, now that that’s finished, i’m not quite sure what to do next…i just have so many choices. i feel like i’m spinning in circles trying to figure out where to start. 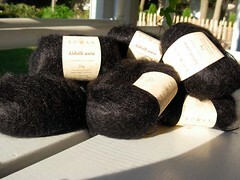 a new arrival this week: rowan kidsilk aura in nearly black. 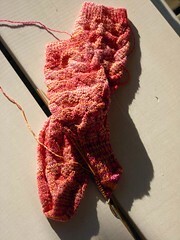 i’m hoping this becomes the leavened raglan from the fall 2007 interweave knits. it’s a silk/mohair blend and is really tempting me right now. 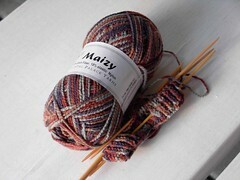 i need to swatch though, i’m not sure i have the right size needles. yet. thus, my monkeys are getting some work. 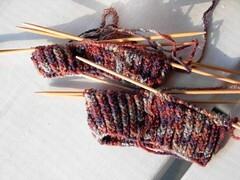 i’m past the heel turn on the 2nd, so it shouldn’t take too long…as long as i don’t pick up another project! oh, and my mom’s socks? they’re going to be monkeys too! ooooh that corn fibre looks interesting and the kidsilk looks divine! 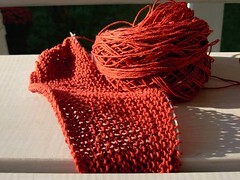 Looking forward to seeing how that knits up.